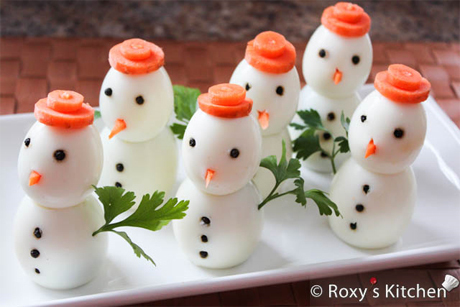 These adorable snowmen - made with hard-boiled eggs, carrots and peppercorns - will melt your heart before melting in your mouth. Eggs are a source of Vitamin D, which is needed to help absorb, carry and deposit calcium in the bone that supports your teeth. Carrots - which are crunchy, firm and full of water - help to scrub your teeth clean like a natural toothbrush.